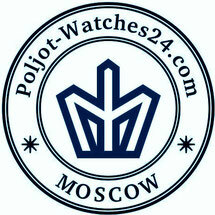 Russian automatic movement 2416 by Vostok, 31 jewels, shockproof, date, date quick adjustment, power reserve 45 hours. in pos. "12:00", the Cyrillic inscription "Vodolaz" (diver), in Pos "6:00" - "WMF ROSSII" (Russian Navy) and "AUTOMATIC 31 JEWELS"
large, grip crown in pos. "3:00"
The dispatch takes place within 5 working days after receipt of payment directly from Germany!